Click the button below to add the New Basic Black Color Cloth Universal Fit Car Seat Covers With Vinyl Floor Mats Set Support Split Seat to your wish list. New basic design car seat covers set made with durable black color fabric provides perfect protections for your car seats. Soft and durable fabric with 4mm extra thick foam (compare to other similar product which only comes with 2 to 3mm foam padding) ensures the maximum comforting. Front seat covers with 2 pockets allow driver or passenger to store and access their cell phone, mp3 player or other personal belongings with ease. 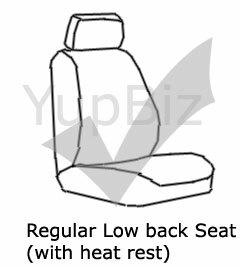 Reduced side design allow upper side airbags to deploy without resistance. Rear cover support center console and split type seats in 50/50 and 60/40 ways. Sets includes: 2 front seat covers, 5 head rest covers, rear bench cover, rear back (top) cover, 4 black color floor mats with black vinyl trim and driver side heel pad, metal hooks. Front mat size 17" X 27", rear mat size 17" X 13". Parts cannot be sold separately. Universal fits all cars with regular size seats, support seats with arm rest. This set also works as a base cover set for our interchangeable head rest covers. Search our store to find out more about the Interchangeable Headrest Covers that comes in many designs to add a little different look to your car. Perfect protection for car seats. Basic design, less fancy. 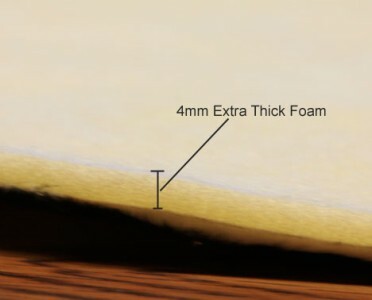 Extra 4mm foam padding for maximum comfort. 2 Front pockets for cell phone or other personal belongings to be access with ease. Note"This seat will not work on large size seats or seats with integrated seat belts. 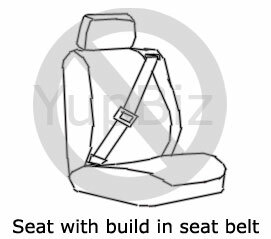 Minor cutting might require for some vehicle with seat belt located at abnormal position. 5. Note: It rarely occurs where the bench seat belts are a part of the chair and also inhibit the usage of the seat covers. If so, you will need to temporarily detach the seat belts. Consult your vehicles manufacturer manual for further information.